I bet you know one just like her: adorable, irresistible, independent, and a member of your family. Nine-year-old Cali is my companion, at least when she wants to be. I love it when she snuggles close to me and purrs. Brushing and petting Cali-kitty is one of the most relaxing parts of my day. 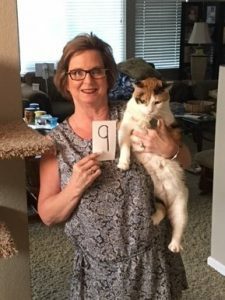 Maybe you have a special cat companion too. Almost everything Cali does is simply adorable and photo worthy. Her album includes posing under the Christmas tree, kissing our dog, playing with tissue paper, dozing in the sun, lying on my lap, exploring bags, and drinking water from our bathroom sink faucet. Cali perches herself next to the sink indicating she needs her personal servant to turn her water on at just the correct flow. Not so much that is splashes her face, but not so little that it takes too long. After all she has a busy schedule being adorable. And apparently she isn’t the only water faucet drinking cat. 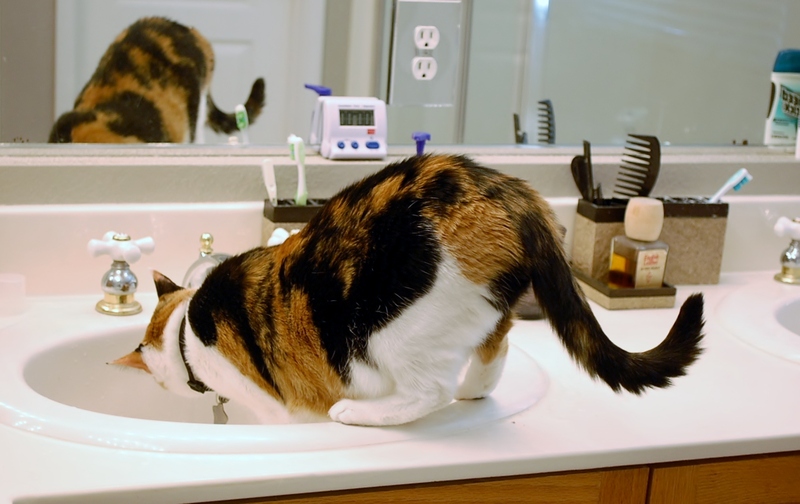 Many cats prefer running water because it’s fresh and they’re attracted to the water’s movement. 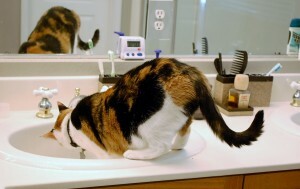 Check out some of these other sink drinkers. Does your cat do this? I bet you even have adorable photos too. Princess Cali begins her ritual by washing her paws and face. A little water on the right paw, wipes paw on face while licking and cleaning. Repeats with left paw. Then begins drinking the perfectly flowing water. Another photo op of simply adorable. I don’t have time to stand around and wait until Queen Cali finishes her routine. I never know how long my precious Cali-kitty will drink, so I leave the water running for her. I go about my business, take a shower, do my make-up, start laundry, or whatever. Then I notice the water’s still running. Oh well. I quickly turn off the water. 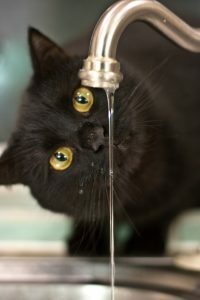 If I’m saving water, maybe kitty can save water too. After all, she is a Cali-fornia cat. She even also has her own hotel: Hotel Cali-fornia, aka the utility room. I expect not leaving the water running or even dripping will be a battle. A battle I will eventually win. But there isn’t a battle. Cali doesn’t even bat a whisker. When she wants water, I add about 1/2 inch of cold water to her small bowl conveniently located on the bathroom counter. Its fresh right from the sink and if I place it quickly, the water even moves. If Cali drinks all the water, I give her a little more. No more adorable photos of her washing her paws. No more adorable photos of her drinking sink. water No more adorable photos of her water play. Just adorable photos of her drinking from her bowl. How about it Cali-fornia cats? How about it all non-California cats? 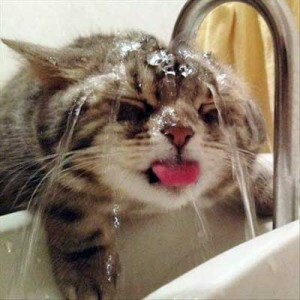 Let’s start a movement – Cats Conserving Water. Now that’s simply adorable. http://www.epa.gov/greenhomes/ConserveWater.htm#wateruse. Accessed June 18, 2015.
http://www.h2ouse.org/action/details/action_element_contents.cfm?actionID=F56F50F2-34E3-4095-9A919C304D945B5F&elementID. Accessed June 18, 2015.